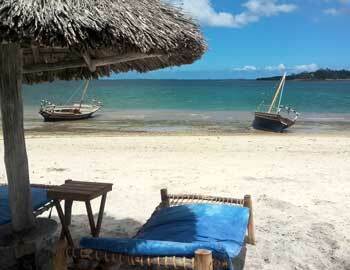 Mafia is unspoilt with untouched beaches and warm air and sea temperatures all year around. Its great variation allows discovering mangrove forests, stretches of golden beach and a brilliant turquoise sea. 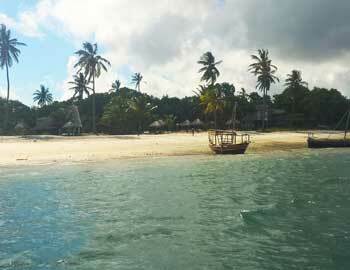 Sleepy dhows sail between the islands of Mafia, Jibondo, Juani, Chole and Bwejuu – all quite unknown . The island as interesting vegetation and wildlife such as bush babies, wild pigs, blue duikers, genets, vervet monkeys and thousands of fruit bats hanging in the trees. The people of Mafia are mainly fishermen or farmers – all friendly and welcoming . 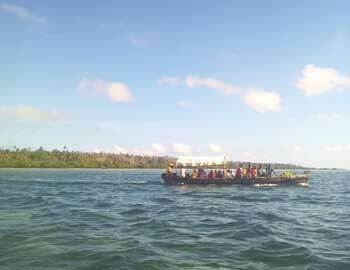 The Mafia Island Marine Park is a conservation area formed to protect the reefs one of Tanzania’s best areas for diving. Its pristine reefs have over 50 kinds of coral and more than 400 species of fish. Visibility is great and even snorkelers are up for a very interesting experience with 10 walls of different sea life reaching 10 meter down. And what Mafia has that is unique are the friendly slow moving, up to 13 meter long whale sharks. Great variation with snorkeling diving, village life, fruit bats. 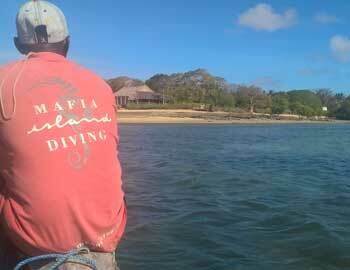 We start at the East side of Mafia, Chole Bay, where the diving and snorkeling takes place. After 5 days we move over to the East side, which is close to the airport and without Marine Park Fee, to see the whale sharks and another part of the island. All diving takes place in Chole Bay- that has a lot of various dive sites. Mafia Island Lodge is situated in Chole Bay. Also the area has some authentic places to discover, Chole Island with its thousand of fruit bats and ruins from the slave trade, to mention one. 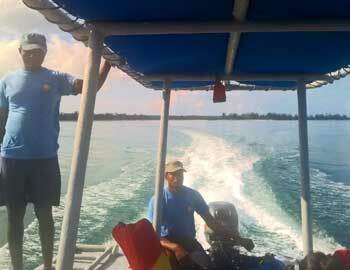 Pick up at airport and transfer to Mafia Island Lodge, a quiet and peaceful lodge with great location in Chole Bay. Good if we walk down to the dive center to say hi and decide about dive days, try equipment etc. There will be time for a swim in the Indian Ocean before the dark and also a cold drink at the beach bar overlooking Chole Island. 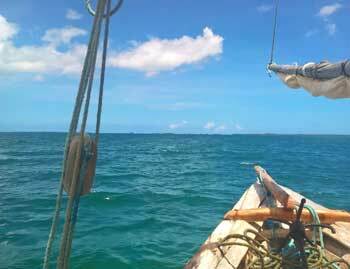 Today we go to sea with a beautiful traditional dhow! 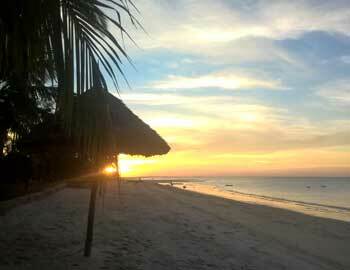 Chole Bay is Mafia´s , and Tanzania´s outstanding dive site with depths from 5 to 27 mt. Outside this natural harbour, you find world-class dive sites with 20m+ deep walls in unspoiled condition and one of the most diverse sea in East Africa. Mafia Island Lodge have a lovely beach bar and we suggest a sunset drink before the 3 course dinner. Today we continue explore the amazing underwater life of Mafia. It is common to spot large predatory fish and turtles and as they are pretty unaffected by divers you will come close. After some more diving it is time to explore a part of the real life on Mafia. 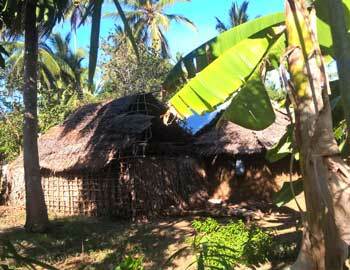 Chole Island opposite Mafia Island Lodge is an authentic experience of life as it is lived around Mafia. During the slave trade Chole was center for a part of the business and inhabited by Arabs. 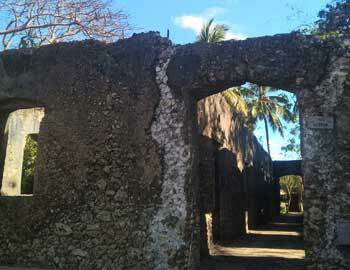 You can feel the winds of history when entering the ruins from the period when the Arab ruled. The jail, slave market and the old home of the Sultan is right there. 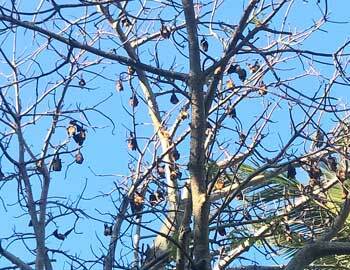 More- the thousands of fruit bats hanging in the trees is an unbelievable sight. No worries! There is still lots to be amazed by in Chole Bay. How about seahorses? Or a night dive? At night the corals are transformed into another color palette as the polyps surface from their hidden homes to feed on the plankton. The night dives are focused on the many small, delicate reef species that are difficult to detect during the day. Transfer to the west side and Butiama Beach (outside the Marin Park Area- no fee). Today we enjoy the lovely atmosphere a Butiama and our bungalow with big private terrace and a garden with cashew trees. Whale shark watching! If between November and February we go out to see this the worlds biggest, and friendliest, fish. At Butiama Beach the crew know how to do this in a way without disturbing the sharks. And they know how to spot the big shadows moving slowly under water. If other times of the year we do a sand bank pic nic instead. Day 8 Home – or Zanzibar, or Safari Selous or…. Regardless of you are in the water or not, every visitor pay a daily fee of 20 usd + VAT when in the Chole Bay area. This is paid by credit card at the gate- the driver will stop and support in payment. When departing again proof of payment needs to be shown so keep the receipt. There are many places to snorkel around Mafia- and you will not get enough of the experience as the underwater scenery is varied and interesting. 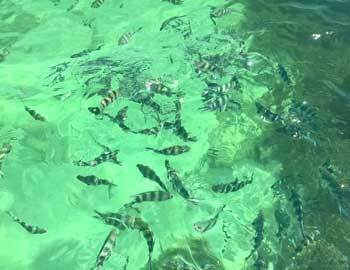 Colourful corals and hundreds of various fish species, huge school of fish, lion fish and lobster. One of the best snorkeling spots are situated 30 min from Mafia Island Lodge and there are also other snorkel spots close to Butiama Beach. Opposite Mafia Island Lodge is Chole Island. 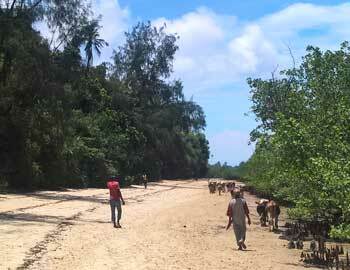 If you want to experience the real life on African Island this is an opportunity. The island was once hub for the slave trade and you can visit the ruins from the period when the Arab ruled and see the slave jail the slave market and the old home of the Sultan. Down by the sea there is a small bar. This is an amazing sunset spot and any day you can take the local “ferry” over to Chole for a sunset drink. Highly recommended. Beside the impressive diving Mafia is known for its whale sharks coming here October- March. These huge fish, that can be up to 13 meter long, are friendly animals allowing us to come as close as a few meters. Whale sharks are generally solitary animals and feed from plankton and tiny fish which they filter out of the water. The whale shark watching takes place on the west side, and Butiama Beach will bring you out in a safe and respectful way. At low tide many of the sandbanks surface. Spending a day on your own sandbank, resting and swimming, while the crew organizes the seafood BBQ is a once-in-a-lifetime experience.